MSRP: Around $35.00 on E-bay listings. Italeri is a prolific model manufacturer based in Italy. The make all manner of different subjects of models in the popular scales. An Italian artillery Colonel named Sergio Berlese (who designed the Obice da 75/18 modello 34) suggested that Italy should create an rmoured fighting vehicle similar to the German StuG III, which had been successful in the French campaign. 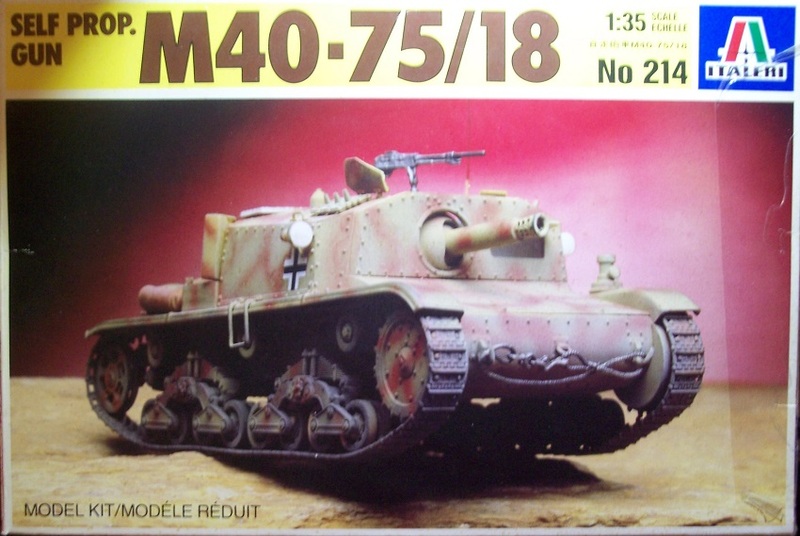 The first prototype was quickly assembled and delivered, on February 10, 1941, only 13 months after the first M13/40 tank upon which it was based. After that, 60 more examples were ordered. They were delivered in 1941, and were then shipped to North Africa in January 1942. This initial batch was based on the M13 chassis, with its weak 125 hp engine (later to be replaced by one of 145 hp, with M14 chassis). Structurally, this self-propelled gun was built with riveted steel plates, which were thicker but also less sloped than in the original tank (50 mm as against 42 mm max). Frontal armour was almost vertical, but it consisted of two plates that strengthened it when compared to a simple homogeneous steel plate. After the Italian surrender in 1943, 123 Samovente 75/18’s were seized by the Germans and they continued production of another 55. They were issued to six infantry divisions, two panzer divisions, 3 panzergrenadier divisions and the 22nd SS Volunteer Division “Maria Theresa” and one Gebirgsdivision intended for service in Italy and the Balkans. Width: 7 ft. 3 in. Main armament: 75 mm with 44 rounds. Secondary armament: 8 mm Breda model 38 or 6.5 mm Breda model 30 machine gun. Engine: Diesel of 145 hp. This kit comes in a shrink-wrapped end-opening type box. I am no fan of this type of box. Parts seem to always find their way past the end flaps to become lost. Give me a tray and lid type box any day. The box art is a color photo of the model made up and posed on a sand base. It is in German markings. One side panel of the box has one paragraph histories of the vehicle in French and Swedish and what looks to be either Japanese or Chinese. It says the kit is not for children under 3 years of age. 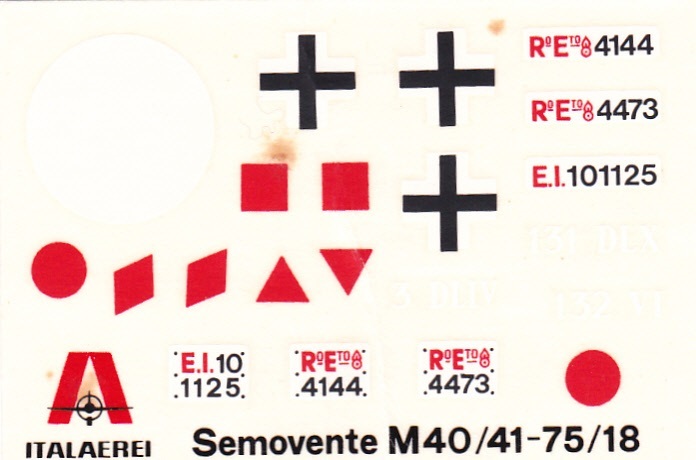 The kit was made in Italy and Italeri’s street address there is provided. The other side panel continues the one paragraph histories in English, German, Italian, Spanish and Dutch. All the paragraphs have color illustrations of the flags of the countries that speak these languages. 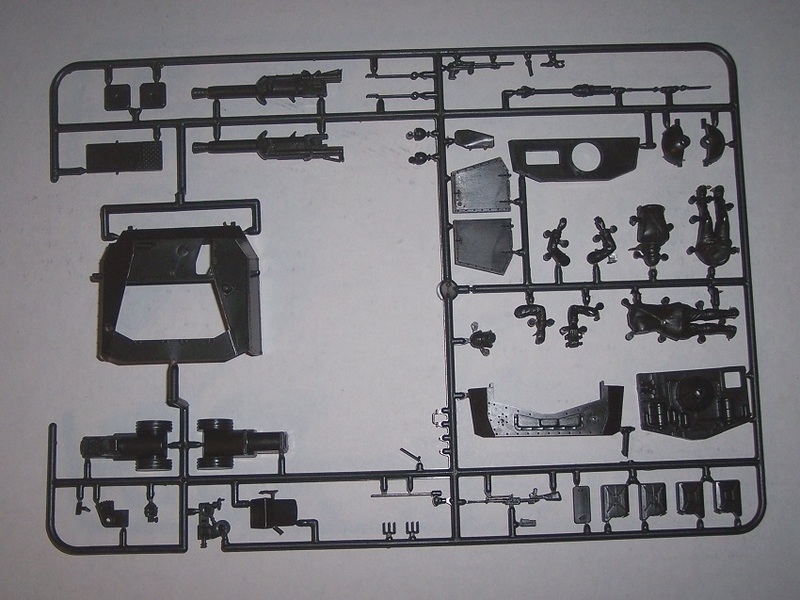 Inside the box are 3 very dark olive drab (almost black) trees of parts. They are loose and not in a cello bag. Rubbing together has caused some parts to have broken off the trees. Bad move Italeri. The treads are the rubber band type and there are two lengths of them molded in bright silver vinyl. Included on this tree are 4 short spare link lengths too. The small decal sheet and the instructions complete the kit’s contents. The instructions consist of a single sheet that is accordion folded into 8 pages in 11” x 6” page format. Page 1 of the instructions begins with a black and white photo of the model made up. This is followed by the history of the vehicle in Italian, English and French. Page 2 begins with recommendations about building the kit in 4 languages including English. This is followed by the parts trees illustrations and instructions of how to stretch sprue over a candle. Pages 3 through 5 give a total of 6 assembly step illustrations. The bottom of page 5 has black and white photos of the model made up. These are a side and a top view. Spanning pages 6 and 7 are three 4-view illustrations of 3 marking schemes. One camouflage is overall sand yellow. The other 2 are blob patterns of dark green and red brown over sand yellow. Page 8 has the marks on the decal sheet across the top of the page and below that tells what the marks are and what their purpose was. This is in 4 languages including English. The bottom of the page has assembly instructions for the 2 crew figures and the colors to use on them. Below this is the history of the vehicle, this time in German. 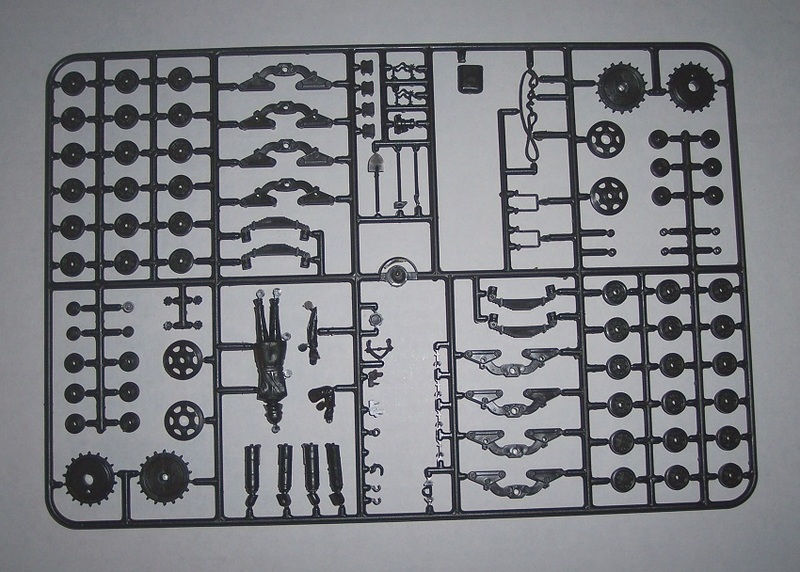 The second large very dark olive drab parts tree holds: the drive sprockets, road wheels, return rollers, idler wheels, leaf springs, tools, jack, tow cable and a third crew figure etc. (117 parts) There is indication that another small part has broken from this tree and gone missing. These trees are not alphabetized and there are no numbers next to the parts on the trees. Numbers are on the parts trees illustrations in the instructions, however...the numbers are not consecutive on the trees and jump all over the place. This means a lot of study of the drawings to match up the part needed will have to be done. Making for extra work to build the kit right and not get a wrong part. Very bad move Italeri. The fighting compartment inner rear wall part was floating around loose in my kit. Obviously it had broken off one of the large trees. The decal sheet is next, it has German national crosses, triangles, diamonds and circle emblems and license plate numbers on it. 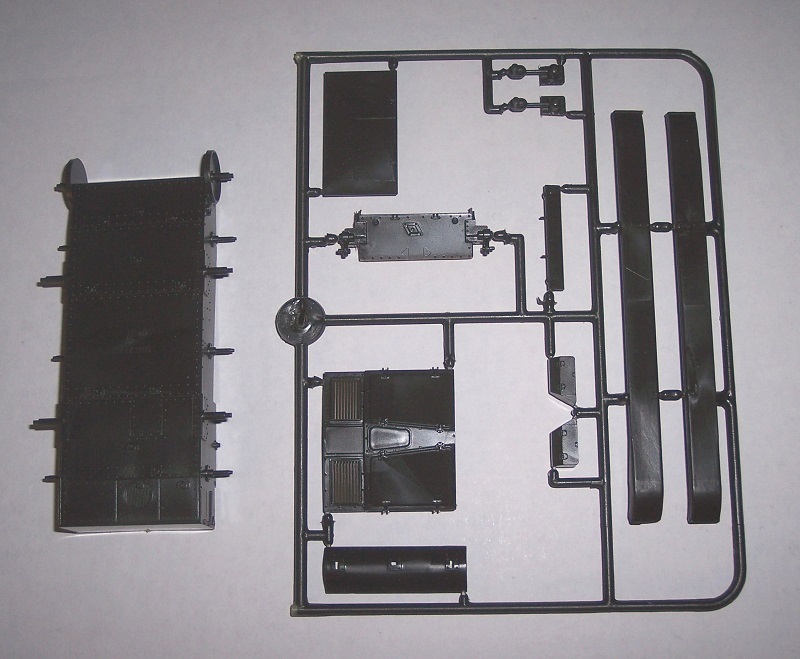 The rubber band treads complete the parts in the kit (already described above). This is a very early issued kit by Italeri. It first appeared in the 1960’s as kit no. 214, in new box art in 1970 with the same kit no., in 1976 in yet another box art with a kit no. that began with a letter H, and again that year in still another box art with the kit no. H.21. It’s last appearance was in the 1980’s with still another different box art and the kit no. 3515. Although, as far as I can tell, it is now out of production, but it can be found all over E-bay. I got my kit as gift from my friend John Kelley. Thanks again John.